This is just a small summary of the Marketing Live event I went two weeks ago from the 5 or so speakers that were there. It seems a trend that CFO’s become more important than CMO’s due to the fact that marketing accountability seems difficult to prove. 9. Accountability (measure from time to time: brand awareness, brand equity, client satisfaction). Overall objective should always be creating brand (added) value. Use your gut feeling (emotional brain) when: choosing your partner, buying a house buying art. Use you ‘senses’ (functional brain) when investing, organisational changes, new product development. How can we generate consumer insights? Base marketing (also product development) on buying motivations and user experiences. Google (Noud van Alem) had an interesting presentation about the 4 Types of engagement. in 2009 group 4 is no more than 5% of total internet users, but this might grow in the upcoming years since people are becoming more and more individual multitasking creators. Google measures engagement by multiplying: clicks x visitors x revisits x feedback x purchase x forward intell x etc. etc. Innovation in the digital landscape is basically just doing it and optimising after launch. Don’t think you know it all in advance. Launch it, monitor it, adjust it. The Dutch gaming industry are developing a unique game during the Cannes Lions Festival to promote the opportunities that gaming have for brands. Follow us on this website http://canneslionsgame.wordpress.com . 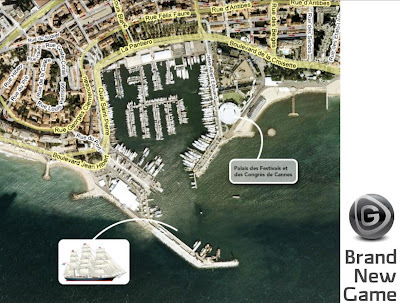 VISIT DUTCH GAME CONSULTANTS ON OUR SHIP “STAD AMSTERDAM” ON THE 25TH OF JUNE IN CANNES PORT STARTING 21.30 HOURS! According to Gordon Calleja gamers have 6 levels of involvement when playing games, from shallow to ‘deep’. “The six frames include: affective, spatial, narrative, tactical, performative and shared involvement. These are described as ranging on a continuum from conscious to internalized involvement. The internalization of spatial and other frames of involvement can result in what I will call “incorporation”. This term replaces presence and immersion with the aim of displacing the binary relationships implied in these metaphors while proposing a clear conception of the experiential phenomenon they are employed to describe. It replaces the uni-directional plunge of player into game-space implied by the term immersion with one of simultaneous assimilation of the digital environment and presence to others within it.” Thus Gordon Calleja. Affective: do I like what I see, does it look attractive and comprehensible? Does it tempt trial!? Spatial: do I understand the environment and basic mechanics of the game? Is the goal clear? Narrative: How does the story involve me, which clues and progress do I get to keep me interested and involved? Tactical: As soon as the above is clear, the player feels comfortable in this digital interactive virtual world. Gamers need to feel they understand and are in control of this constantly changing environment. Performative: Searching for the boundaries of what I can do in-game (mastering the game). The gamer is bending and tempting the rules of play so to speak. Character identification probably takes place in this face and the virtual world and reality seem to start blurring. Shared involvement: In what way can I interact with objects and (virtual) characters and (real life) team mates? In short: in-game socializing – a highly underestimated virtue of gaming (by non-gamers) if you ask me!